while a sturdy frame and ultra-grip quad base four-tier design rubber tip make it extremely safe and reliable. √ Made of high quality aluminum tubing for perfect support and durability while allowing it to remain lightweight. 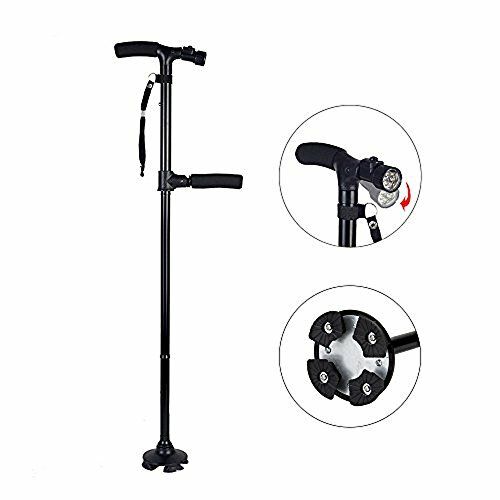 √ Foldable walking cane is great for portability where ever and whenever you need it. It is fully adjustable from lengths of 33" to its full length of 37" and has 4 increment adjustments of 1". Can fold and store away to a size of 11". √ The 6 built-in LED lamps can directly point forward 20 meters and adjust to different illumination angles. To use, simply press the button on top for the light to turned on. It is a portable and convenient night walking helper. √ The sturdy wristband can prevent slip-and-fall accidents when used, and provide convenience when folded and stored. √ Anti-marking rubber tip prevents falls and keeps you safe. The pivoting quad base four-tier design allows for better traction. The cane tip provides superior grip and helps absorb impact shock throughout the walking motion. * The light has a paper over the battery , please remove the piece of paper for the light to work. Two Sturdy Handles: Made of high quality aluminum tubing for perfect support and durability while allowing it to remain lightweight. The sponge handle is so user-friendly that it can reduce the damage to hands caused by vibration. It's super comfortable and has no rubs to hands. This is the best folding stick, it will help you walk and keep you save. Quan Cane Base: Offers more strength and stability. The pivoting quad base is ergonomically designed. It features a 360 degree free rotation and 4 points of contact for independent standing and free bending. Supports up to 250 pounds. The powerful lamp provides exceptional brightness which allows you to walk better, see better, and feel better.The pivoting quad base four-tier design allows for better traction; prevents falls and keeps you safe. Built-in 6PCS LED lights: Directly point forward 20 meters and adjust to different illumination angles. The revolutionary Path lighter cane not only provides the exceptional support of traditional orthopedic offset style canes, it offers the added safety of a light built right into the shaft to help see what surrounds you. It provides additional safety in the dark for the vision impaired as well as peace of mind for their loved ones. 5- Adjustments: Fully adjustable from lengths of 33" to its full length of 37". Designed with two handles, help to stand up or sit down more easily and safely. Simply spread the pivoting handle, lean forward and push up, easing the strain on your back and legs! With this walking stick, everyone sit and go up easier. Comfort Handle: Made of soft sponge but very sturdy to grip. Lightweight and foldable, it is convenienient to carry into your bag.